For the past 12 months, Robert Mueller has taken every shot from President Trump and his media boosters -- but the investigation into alleged Russian meddling in the 2016 election goes on. Thursday marked the one-year anniversary of Mueller's appointment as special counsel overseeing the probe. Fittingly, the night before, Mueller was the target of yet more scrutiny and pressure from Trump's allies, this time from Rudy Giuliani. It was doubly fitting that Giuliani fired his warning shot on Fox News, which has spent the better part of the past year trying to undermine Mueller's investigation at every turn. "It's been a year, he's gotten more than 1.4 million documents, he's interviewed 28 witnesses, and he has nothing," Giuliani said Wednesday night on the network. Giuliani has been a vocal booster for the president, delivering a fiery speech at the 2016 Republican National Convention and serving as a surrogate for then-candidate Trump on the campaign trail. 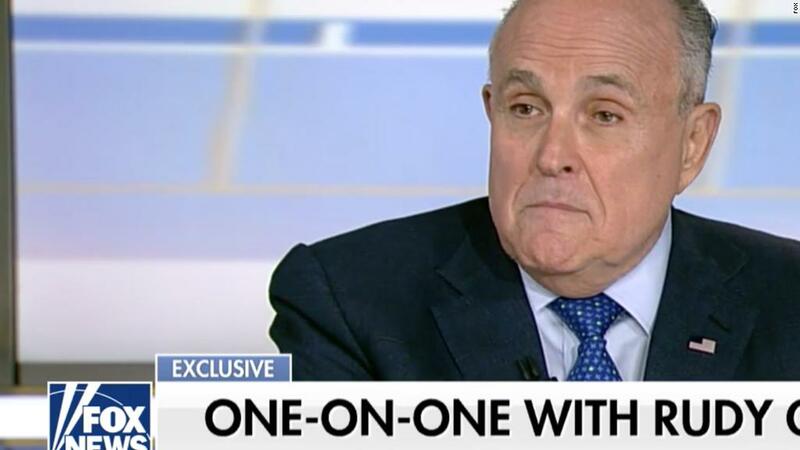 Since joining Trump's legal team on April 19, Giuliani has given a total of six TV interviews; all but one -- a May 6 interview on ABC -- was with Fox. He's also conducted phone interviews with others, including CNN. Giuliani followed up his interview Wednesday night with Fox News commentator Laura Ingraham with an appearance Thursday morning on "Fox & Friends." The former New York City mayor has taken a combative approach toward Mueller in those appearances, reiterating Thursday what he said on "The Ingraham Angle" the night before: The special counsel cannot indict Trump. "My job is not to, you know, lean over and let [Mueller] beat the hell out of us," Giuliani said Thursday on "Fox & Friends." "That's what was going on before I got here." Giuliani has embraced his role as a "new sheriff in town," but his critiques are a continuation of the year-long onslaught against the investigation from the president and his media cheerleaders. The appearances on Fox, a consistent supplier of pro-Trump coverage, likely allowed Giuliani to reach an audience that is increasingly critical of the Mueller probe. A CNN poll released last week found that Republicans are turning against the investigation. Last month, a poll from Quinnipiac University revealed a similar finding, with six in 10 GOP voters calling the investigation unfair, a 15% spike from March. And those critiques have come in many different forms. In his interview Wednesday with Ingraham, Giuliani said Trump's legal team is "trying to get [Mueller] to end this," echoing what Vice President Mike Pence said last week. "Our administration has provided more than a million documents; we've fully cooperated in it, and in the interest of the country, I think it's time to wrap it up," Pence said. Fox's roster of pro-Trump commentators have been relentless in their attacks on Mueller, focusing much of their criticisms on purported conflicts of interest and political bias within the investigation. Earlier this week, Fox News host Tucker Carlson took aim at the absence of Republicans on Mueller's team. "The whole point of an independent counsel is to assure the rest of us that the investigation is on the level, that it's not tainted by potential conflicts," Carlson said. "Given that, why didn't Mueller try harder to at least seem bipartisan, maybe hiring one registered Republican as an investigator?" And of course, the president himself has echoed many of Fox's criticisms, stoking speculation that he may ultimately fire Mueller. Trump has consistently denied any collusion with the Russian government, and he pushed back on reports that he wanted to fire Mueller late last year. During a phone interview on "Fox & Friends" last month, Trump unloaded when asked if he would agree to an interview with Mueller. "Well, if I can. The problem is that it's such a — it's such — if you take a look they're so conflicted. The people that are doing the investigation — you have 13 people that are Democrats," Trump said. "You have Hillary Clinton people. You have people that worked on Hillary Clinton's foundation. They're all — I don't mean Democrats, I mean like the real deal." It was a rare interview for Trump, who has largely shunned the press since he fired FBI Director James Comey last May, a little more than a week before Mueller's appointment. Trump sat down with NBC News anchor Lester Holt the day after Comey's ouster, virtually all of his TV interviews since have been with Fox.